A big part of training is the body's ability to recover, so we can train day after day. I have a full time job, so taking naps on a regular basis doesn't fit into the equation. I do have a few favorite recovery techniques . 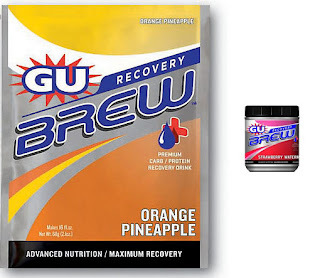 . .
Gu Brew Recovery: Not only does it taste good, but it's got the right mix of protein, Amino Acids, Vitamins C & E, lots of good-for-the-body stuff in it. 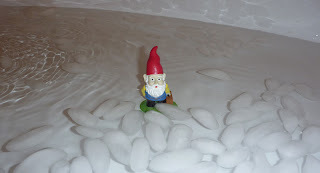 Ice Baths: Once you get past the first minute, it makes the legs feel oh so great! Drinking tea while sitting in the icy water helps! 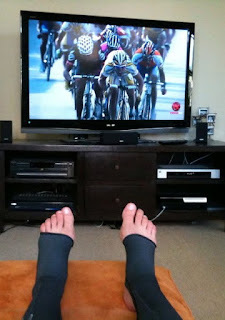 Compression Pants: They may look funny, but these tights work. 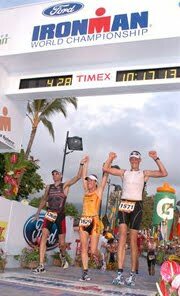 After a long run or ride, it feels like my legs are getting a massage. Healthy Food: I try to put lots of color in the shopping basket, with minimal "processed" stuff. This isn't to say that ice cream doesn't live in our freezer as well, just that variety is good. If you have some recovery tricks I haven't listed let me know!